NBA TV will premiere its Players Only: Monthly series with an hour-long interview between longtime friends and former competitors Earvin “Magic” Johnson and Isiah Thomas. The wide-ranging and emotional conversation will tip off the network’s new monthly series on Tuesday, Dec. 19, at 11 p.m. ET. 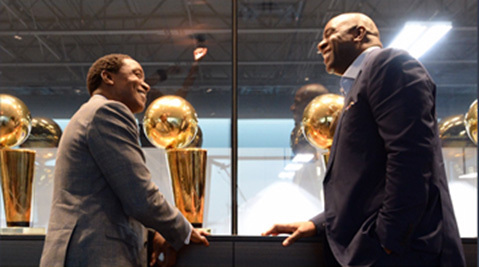 During the episode, Johnson and Thomas reconnect and look back on four decades of memories and experiences, including the 30th anniversary of the 1988 NBA Finals, the pair’s off-season travels and bonding, how the two balanced their friendship and competitiveness, and the ups and downs of their relationship leading up to their recent reunion. Johnson on why he mentored Thomas and others by showing them how to win: “First, the love I have, and still have for all of you guys… It was the way we were raised… My thing was, pay it forward; and look what you did… We are in a fraternity that is special… The difference is, you did something with [the knowledge]. The Players Only franchise – one of the latest NBA content initiatives to debut from Turner Sports – is centered on showcasing the game exclusively through the unique lens of the professional basketball player. The network’s live game and original programming Players Only coverage incorporates a more conversational delivery and deeper insights into the game – directly from the athlete’s perspective. All commentators appearing as part of Players Only are current and/or former professional players. NBA TV’s new Players Only: Monthly series will present expanded themed segments throughout the season from the network’s leading commentators including Diesel’s Dunks [Shaquille O’Neal], Smitty’s Under the Rim [Steve Smith], 3D’s Shooter’s Paradise [Dennis Scott], Isiah on Point [Thomas] and Sam Mitchell’s Rookie Update.